The peak wireless data transfer speeds of the QCA9994 and QCA9984 Wi-Fi chips will reach 1.7G bps (bits per second). That speed can be achieved through single or multiple data streams from devices on an 802.11ac Wi-Fi network. The speed tops Qualcomm's previous high of around 1Gbps, which it achieved in products released last year. To put the wireless speed in perspective, the data transfer speeds of a wired USB 3.0 connection peaks at 5Gbps, which in most cases is considered adequate for external hard drives. An average home has 20 Wi-Fi devices, which can be served simultaneously with a two to three times lift in performance, said Irvind Ghai, vice president of product management at Qualcomm Atheros, the wireless unit. The new chips could help in video streaming, online gaming, and other applications that take up a lot of wireless bandwidth, Ghai said. In fact, multiple devices on a network will be able to take advantage of the speed boost with the chip's support for a technology called MU-MIMO (multi-user, multiple-input multiple output). The technology allows antennae to transmit data to multiple users or devices simultaneously. The chips support up to four simultaneous data streams to reach the peak speed of 1.7Gbps. 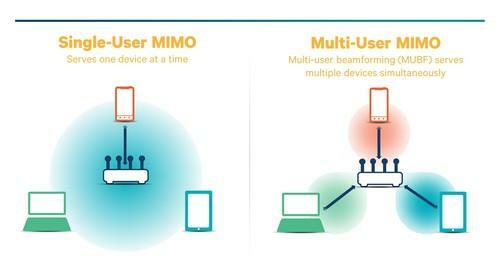 The MU-MIMO technology is in devices from Acer, Xiaomi and ZTE. Support for MU-MIMO could make the chips handy in crowded areas such as public Wi-Fi hotspots, Ghai said. The speed boost also comes with the ability of the chips to take advantage of the open 160MHz spectrum, which provides a wider pathway for wireless data transfers. Routers can reach the 1.7Gbps speed over one connection on the 160MHz spectrum, or over two simultaneous 80MHz connections, which provides lesser bandwidth but can be combined to reach peak speeds. The ability to break up data transfers into multiple channels is handy in case there's interference at the 160MHz spectrum, Ghai said. Interference could come from radar or other devices using the spectrum. Routers with the new chips could be on the shelf by the end of this year. The technology could first be in enterprise-grade routers, and later reach home routers. Qualcomm announced the technology at Computex trade show in Taipei, where the company will demonstrate routers based on the chips.